I'm just astonished i've not been shouted at as heretic yet, simply because i say F-35 is not the best at "everything"
Cavok, I do not know you. Based on your emphatic and passionate defense of the Rafale, and your quoting French military / industry / government websites, I am guessing you are French. As such, English is probably not your native language. One of the reasons we are giving you such a hard time around here is because of your statement, for example, that design choices "prevent him from being good at air policing or interception." So as an English speaking person, I interpret your statement to mean that the F-35 is NOT good at air policing or performing air-to-air intercepts. Is that what you really mean? Or do you intend to say that the F-35 is NOT best at air policing / interception? In other words, F-35 was not designed for air policing mission, nor was it designed to be an interceptor, therefore it is not best at those missions? If that is what you mean, I could agree with you. It's not that you are saying "the F-35 is not best at everything", it is that you are saying the F-35 is no good at air policing or as an interceptor. The Norwegians, Dutch, Danish, and Aussies must all disagree with you, as they are moving towards only flying the F-35 as their only tactical fighter aircraft. If the F-35 is really "no good" at air policing and interception, do you ** really ** think they would be purchasing the F-35? So, if you are really meaning to say that the F-35 is not good at air policing, and is not a good interceptor, then I have to strongly disagree with you, and I think you will find that you will continue to be the subject of scorn and ridicule on this forum. They aren't more efficient, their engine and inlet are specialized to produce high thrust at high speed. Below 20k ft, Mig-25, SR-71 top speed are actually slower than F-16 at the same altitude. cavok wrote: There is no clue about that. The chosen 1.44 coefficient is purely arbitrary and do not reflect the efficiency of different engines at different pressures. maths are ok, but too many approximations in prerequisites. No. And the analysis is made with which hard data? I don't think you can really say that his estimation is arbitrary when you literally literally just judge their aerodynamic by whether they looks fat or not. Speed isn't F-35 strong point but its subsonic acceleration has been confirmed by pilot to be even better than F-16 (which is already better than Su-27). A picture is worth a thousand words and if you would like to show visual proof yourself by all means please do so, but im not holding my breath as you still havnt provided even comparitive cost numbers. Also you don't seem to comprehend the quote was from a test range, (hence the turning), was talking specifically about the F-35B, and of course you are selectively ignoring the dozen other quotes directly from the pilots themselves, rather than dave quoting a side conversation in passing. That's called cherry picking, And basically means you have an agenda rather than seeking the truth. Which is an absurd proposition. It's as ignorant as me saying the rafale can't do air policing because it's wings are "too long"
You're looking at subjective looks, and the people here are looking at verifiable numbers and first hand accounts. So not how it "looks" to perform but how it actually performs. I don't care how it looks I care what it can do. SDD is wrapping up. This isn't 2007, we know what it can do 500 pilots are F-35 qualified and your making insinuation that are not true. It's as "fat" and "slow" as a Rafale so take that as you will. For a fanboy like yourself that's probably tough to swallow, but for those interested in honest comparison it means they are essentially even. There is a big deference between something being "best" and saying incapable. You seem too blind or stupid to tell the difference. I'm glad you have observed people are not shouting you down as a zealot, and instead are using facts and evidence. Now where is yours? I take that hint as an indirect reply to my latest post and guess what?? No one needs to know French in order to understand that video which you refer to IS EDITED. - In part of the video there's footage of the Rafale doing turn maneuvers when in fact it should be flying in a rather straight line (in order to attain that supposed Mach 1.7 speed). Aside from a YouTube video do we have any numbers and data from any credible sources or publications? Because what we have right now is someone referencing a video that doesn't actually display the act claimed, but has people talking about something we are not shown. Call me a fuddy duddy but covak is telling you to look at something that is not there and when you note it's not there, he decries your lack of French understanding. Guess bullsh!t is different in French? geforcerfx wrote: Cavok what are you intercepting? A fighter? a Bomber? a Cessna? Most air policing missions are done at subsonic speeds, we have this amazing ability to track what's going on around our airspace for thousand's of miles giving you plenty of time to react. American radars can pick up Russian aircraft while they are still in Russia, time is on our side far more then in the 50's and 60's. For those ohh crap emergency's most of them have been subsonic civilian aircraft, you don't need a mach 3 interceptor to catch one of those, if anything you need a aircraft that's comfortable in the opposite side of the speed spectrum. Mach 1.6 vs 1.8 is a pretty trivial number. What's the top speed of a rafale with 2-3 tanks and 4 aam's? Is it m1.8? if so how long can they maintain that? The guys I talked to at luke were amazed with how fast a bomb and fuel loaded F-35 got to m1.4 at altitude, and then how easily it maintained it, maintaining mach 1.4 with a 5,000lbs bomb load was done in lowest gate burner. Anything the F-35A can't catch at 1.6 the rafale isn't catching at 1.8, and even if it did, what did it bring with it? Steve some F-15's from Oregon's Air guard broke the barrier near Seattle when Obama was visiting like 3 or 4 years ago, scared people because they heard the booms and thought someone had bombed the President. A aircraft entered the presidents no fly zone so they were scrambled up to Seattle and hauled a$$ the whole way up. gta4 wrote: OK someone is using 1500kg fuel to calculate T/W ratio of Rafale. Why not using the same standard and calculate the T/W of F-35 and pit it against Rafale? What does exactly "ff" and "LW" mean in your picture? ff is fuel fraction, the percentage of the total weight that is fuel. LW I thought was loaded weight, but I will let him clarify that one. As sprstdly said FF is fuel fraction and LW is loaded weight. Fuel fraction is fuel weight/loaded weight. Loaded weight is the loaded weight with specified fuel load (in this case 1/4). I list both 1/4 internal FF and full internal FF. As stated before 1/4 loaded weight numbers came from subtracting 3/4 fuel load from the loaded weight. The EF brochure from Airbus says the Max Speed is Mach 2.0 with full air to air missiles load. Is it possible to say what the Max speed of the Rafale is. When the Rafale can supercruise at mach 1.3 with 6 Mica and 1 fuel Tank (1300l)? With same Weapon load of course. swiss wrote: Is it possible to say what the Max speed of the Rafale is. When the Rafale can supercruise at mach 1.3 with 6 Mica and 1 fuel Tank (1300l)? With same Weapon load of course. What's the source on that stat? playloud wrote: What's the source on that stat? Its from a brochure from Dassault. I posted already here. But again its in German. cavok wrote: I'm 100% ok with that optimist. F-35 can do intercept as good or better than what it is replacing. Nearly Every F-35 combat metric is measuring it with a full tank of gas and 4000 pounds of bombs. On an intercept mission it would have just AAM which is lighter and no external stores to add weight and drag. You trying to say the F-35 can't do intercept is like saying the sun revolves around the earth. You can also add that a missile hasn't been fired in anger above m1.2 I think that was a f-15 with a top speed of m2.5, to add insult to injury. Acceleration counts, but even cleared for m1.4 seems a waste of time. Hint for canard fan: So attack the f-35 1 vs 1 on transonic acceleration against a gen 4 with a couple of missiles and forget top speed, it just makes you sound OCD. You do know that gen 4 can't crack M1 with tanks and bombs don't you? MiG-25RBs participated in the first Iraqi air offensive against Khark Island, which was launched in August 1982. Operating at high speeds and altitudes, they proved exceptionally difficult to intercept. For even the best and most aggressive IRIAF Tomcat crews, a successful ‘Foxbat’ interception was the ultimate exercise in precision flying and high-speed operations, causing heavy cockpit workload. Yet, like all IRIAF pilots, those of the 8th TFW were eager to attempt an engagement. This eagerness intensified after September 1982, when IrAF MiG-25RBs started flying missions deeper into Iran, striking civilian targets and causing dozens of deaths. Iraqi ‘Foxbat’ operations grew to such a degree that F-14As deployed at Mehrabad had to conduct 24-hour CAPs over the Iranian capital. During these difficult times, patrols were limited to nocturnal hours or during Friday Prayers. CAPs were initially conducted at 30,000 ft, but when a MiG-25 was detected, the F-14s would climb to 40,000 ft and accelerate to Mach 1+. The ‘Foxbats’, however, usually operated at between 60,000 and 70,000 ft and flew between Mach 1.9 and 2.4. They proved evasive targets, and it took the IRIAF some time to learn how to intercept them – mainly by changing patrol altitudes, positions and speeds. control warned him that the bandit was rapidly closing to 113 km (61 miles), so the crew had to work fast. While Rostami accelerated, his RIO tried to acquire the target, but his efforts were briefly hindered when the MiG pilot activated his own ECM systems and swiftly closed to 71 km (38 miles). Despite the jamming, Rostami’s RIO was able to obtain a positive radar lock-on and fire a single AIM-54A in a snap-up engagement from 64 km (34 miles) as the F-14A accelerated to Mach 1.5 and climbed to 45,000 ft. The missile separated properly, the engine ignited almost instantly and the hefty Phoenix thundered away trailing white smoke. After the launch, Rostami turned his Tomcat slightly to the west and reduced speed and altitude to avoid approaching the MiG too fast. He held the target just inside the radar envelope. confirmed that the Iraqi fighter had disappeared from their radar scope. The MiG-25RB crashed into the sea. The Iraqi/Soviet ‘Foxbat’ community vowed to take revenge after this loss, and on 4 December two MiG-25PDs penetrated the airspace over northern Iran and tried to intercept an airliner flying from Turkey as it passed over Tabriz. While searching for a target, the MiGs separated. Unknown to them, the IRIAF had vectored a single 81st TFS F-14A, flown by Maj Toufanian, into the area. His AWG-9 was on standby, and only the ‘Combat Tree’ equipment was being used in his approach to minimum AIM-54 firing distance. As soon as the radar was activated, the ‘Foxbat’s’ on-board RWR warned the pilot of the F-14’s presence and the MiG-25PD immediately accelerated. The Tomcat crew watched in awe as their target attempted to out-turn the AIM-54 that they had fired at it. This time, the Phoenix malfunctioned. It missed, passing behind the ‘Foxbat’, but Maj Toufanian, who was one of the first, and most uncompromising, Iranian F-14 pilots, powered his jet up to Mach 2.2 and went off in pursuit. After the first Phoenix had missed, the Iraqi pilot slowed down, obviously feeling safe. But he had effectively signed his own death warrant, for a second AIM-54 blew the ‘Foxbat’ out of the sky. 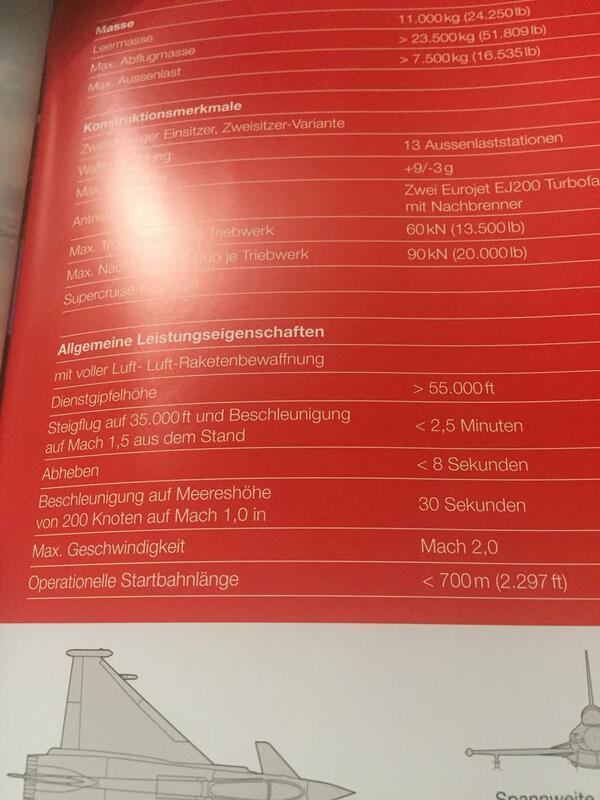 swiss wrote: The EF brochure from Airbus says the Max Speed is Mach 2.0 with full air to air missiles load. I guess that depends on what Airbus means with "full air to air missiles load". This way I certainly believe that the Typhoon could reach Mach 2 but otherwise with wing pylons and missiles loaded on the wing pylons loaded and worse even with external fuel tanks, I pretty much doubt it. XanderCrews wrote: Looks are entirely subjective. I think the rafale looks like hammered dogsh!t with a radar signaling refuelling probe stuck in as an afterthought, but im not here trying to convince people that since it looks like dogsh!t it can't fly past mach 1, since dogsh!t isn't capable of flight? The Rafail is fat turd compared to the F-104, and it's slower too. What a crappy plane.